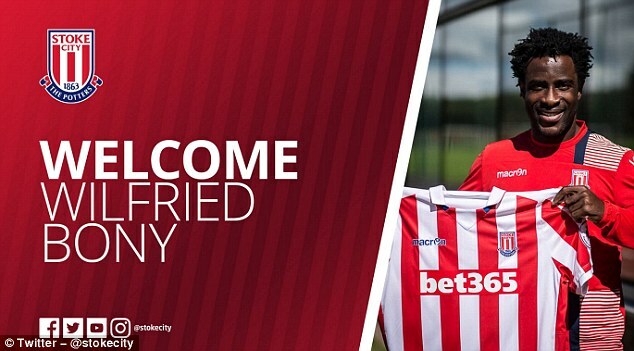 Stoke City have finalised the loan signing of Wilfried Bony. The Manchester City striker has joined the Potters for a £2million loan fee with Stoke paying his £120,000-a-week wages. Bony, whose move to City never really sparked into life, seemingly spoke about the move on Twitter on Wednesday. ‘It’s a new day and I look forward to a new exciting challenge,’ Bony posted on social media. The Ivorian took to Twitter for a second time after his move was formally confirmed by Stoke. He wrote: ‘Thank You to all the MCFC fans for the support & hello to @stokecity fans I look forward to a great season together’. Potters manager Mark Hughes described his move for the forward as a ‘no-brainer’. ‘He knows the Premier League and has scored plenty of goals at this level,’ Hughes told Stoke’s official website. ‘He has power, speed and very good physical attributes which will undoubtedly help us, and his technical and finishing skills are outstanding too. ‘Eighteen months ago he was being bought for a hugely significant amount of money, so we know that we are bringing in a top quality striker. Bony joined City from Swansea for £28m in January 2015 but never truly established himself at the Etihad Stadium. The 27-year-old had to make do with playing second fiddle to Sergio Aguero, but when he did get on the pitch he was largely ineffective. Stoke’s move for Bony may signal the end of their interest in signing West Brom forward Saido Berahino this summer. Berahino – who jetted off on holiday on Monday – has been desperate to leave The Hawthorns for a substantial period of time, but is now prepared to see out the last year of his contract. Stoke and Crystal Palace were both interested in signing the 23-year-old, who is already exploring potential free transfers overseas. Wine Bar and Charcuterie. Do not forget your driver!